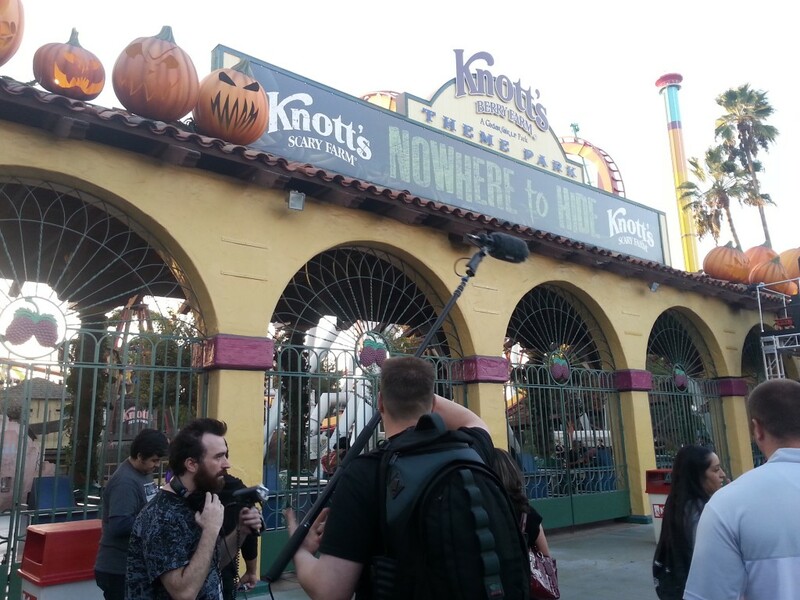 Behind The Thrills | Horror, humor, gore and fun-A look at Knott’s Scary Farm 2013! 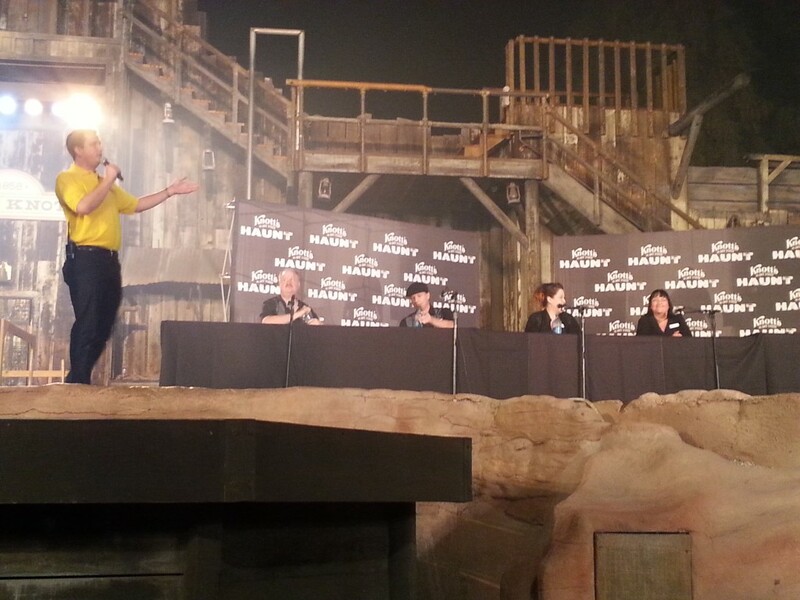 Horror, humor, gore and fun-A look at Knott’s Scary Farm 2013! Whether you’re a fan of this event or not, there is no denying that Knott’s created the modern theme park Halloween event that we love and cherish. Not only are they the innovators but they are the oldest running haunted event celebrating their 41st year as well as the largest, this year with 5 New Mazes, 1 Attraction Overlay, 1 New Upcharge Maze, 6 Returning Mazes, 4 Scare Zones, and 6 shows including The Hanging as well as Elvira’s Sinema Séance. In this review we will mostly spend our time going over what is new this year, and breezing over the returning mazes since they’re mostly the same as last years. Keep in mind we were not able to do everything on opening night. This is a massive event, even in a full you cannot manage to see everything, I still have yet to experience Possessed which is said to be the total sleeper hit of Knott’s Scary Farm this year. With that aside let’s take a look at the media event we were invited to! The nights festivities began with a new Scareamony for the press which involved a bit of human sacrificial fun. You can check out the full opening scene below! 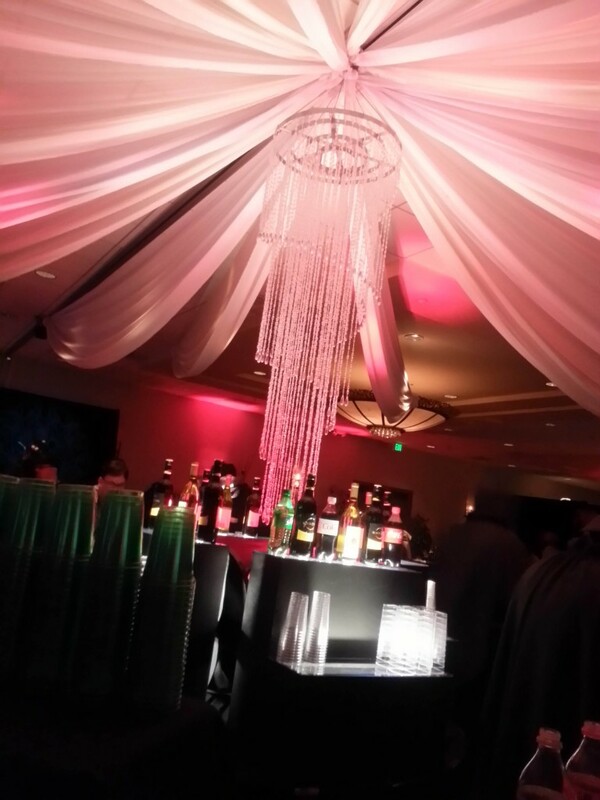 Afterwards the media was quickly hurried back to the Knott’s hotel where they were greeted with a beautiful horror-lounge filled with lots of delicious goodies and an open bar centerpiece. 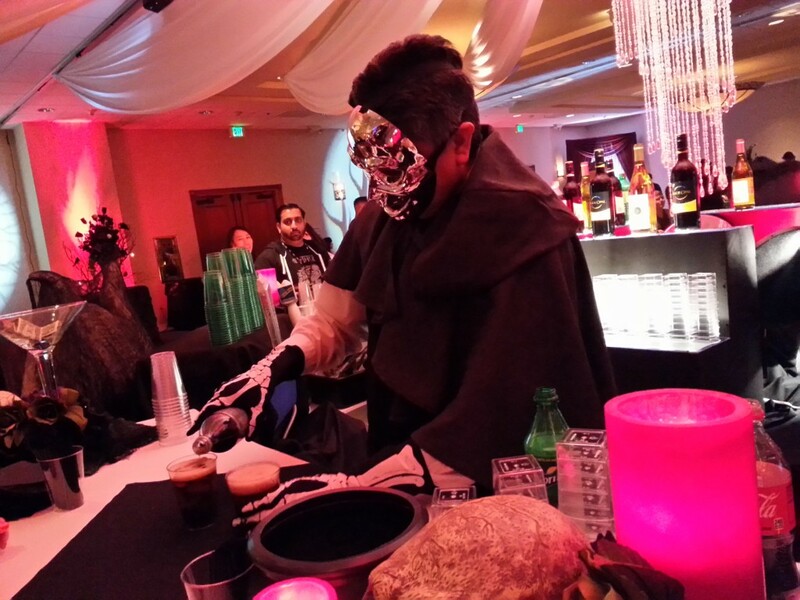 The bartenders and employees all had these great chrome skull masks on. They were awesome all night long. After an hour or so we headed into the park for our grand tour of all the new offerings this year, as well as through some past mazes. This review will focus on what is new. Midway through the tour we were lead into the Wagon Camp theater (one of the MANY theaters at Knott’s). For a special 46 minute Q and A with the haunt creative team. We learned that plans are well underway for next years event! Seriously cannot wait. After the Q and A session we headed back into the park to finish off the new mazes, revisit some old ones and check out this years “Hanging” offering as well as the grand return of ELVIRA! The media event was one of the best I’ve ever attended. 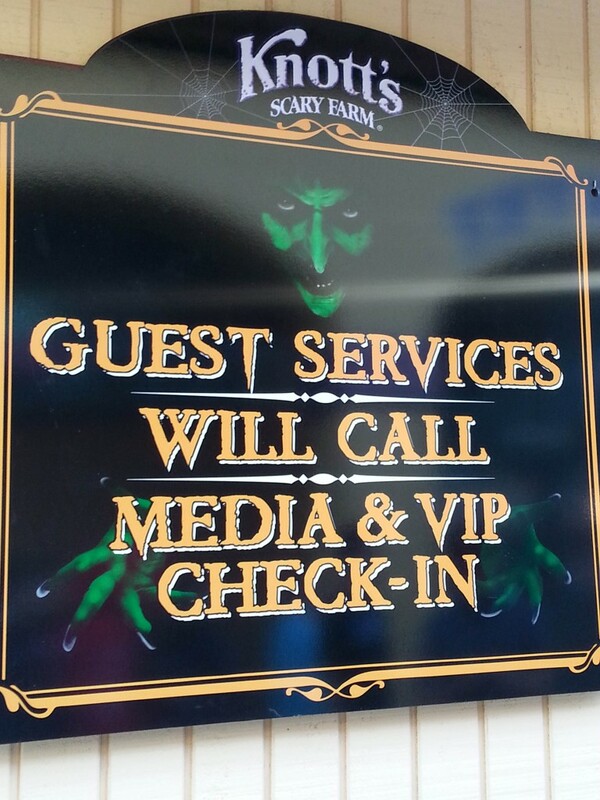 We weren’t herded like cattle as you seem to find at most media events and we managed to see about 80% of Haunt (A MAJOR accomplishment, Haunt usually takes 2 visits to complete 100% due to its size). With all that aside let’s talk about the new mazes this year. Forevermore, Black Magic, Gunslinger’s Grave, Dominion of the Damned, and Mirror Mirror. Forevermore takes the former location of the popular maze ‘Terror of London’. Designer Brooke Walters tells the modern tale of a serial killer on the loose who takes the term ‘fandom’ to a whole new level recreating Edgar Allen Poe’s most famous works of fiction. This maze isn’t like your normal “Poe” mazes, having the modern twist makes it a unique venture from the norm (something Knott’s Scary Farm THRIVES at accomplishing) and introduces a new Haunt killer, The Forevermore Killer. The maze itself is the longest maze at Knott’s and features a multitude of different scenes including a silo with a giant pendulum swinging above you, and a very memorable final scene taking place in the “Red-Clock Club” all while verses from Poe’s famous books are read out loud. It’s a new look at some very classic stories, something Knott’s has been doing for years with mazes like ‘Terror of London’ and ‘Pinocchio Unstrung’, and Forevermore fits right in with the bunch at Haunt. There was a lot of hype leading up to the debut of Black Magic, Daniel Miller’s 2013 offering. It takes the concept of Houdini’s interest in the occult, and asks a question “what if Houdini’s magic was more than magic?”. After his death on Halloween in the early 1930s, his wife attended a séance where Houdini crossed the realms of our world and the world beyond to seek revenge with an army of evil and twisted illusionists. Black Magic is certainly one of the high-lights of Knott’s this year. From the moment you step in front of the Façade, which doubles as a multi-plane projection surface you are immersed into Daniels vision of Black Magic. The Exterior is based from old vaudeville theaters of the 1930’s with a hint of inspiration from the Bioshock video game series spread throughout the maze. Did Black Magic live up to the hype? Absolutely. It’s visually, thematically, and technically one of Knott’s best. Using scare tactics, animatronics and featuring LIVE magic tricks performed by actors inside of the maze itself! It’s hard to think of a concept that can be executed so beautifully with so much attention to detail. The façade features projection mapping, something no theme park haunt has ever attempted to date which worked beautifully to set the theater on fire as well as bring it to life, literally. It’s safe to say Black Magic will be around for a few years to come. We recommended heading to Black Magic early, the line is one of the longest at Haunt. Gunslinger’s Grave is a new maze this year by Haunt new comer Gus Krueger. This maze is very unique in the world of haunts in that it takes place in a real world. No Monsters, no Ghosts, just a man seeking revenge, and a lot of gore. Gunslinger’s Grave follows the path of revenge that the nameless Gunslinger embarks on after his wife and children are murdered in a fire by the Red Hand Gang. You encounter the Red Hand’s early in this maze as they threaten, and try to hold-up wandering park guests through caverns in the outskirts of a small mining town. The layout of this maze is also very innovative in that it introduces a brand new Indoor-Outdoor technique. To put it into perspective, when you are not inside of an actual building structure, you are physically outside both thematically and physically, when you enter the façade of a building, you are inside thematically and physically. It might not sound like much but it really adds a level of immersiveness that I’ve yet to see at any other haunted event. Being that this maze is not based on “boo-scares” that you find elsewhere, it’s required that the talent must be on their a-game the whole run of haunt otherwise it become a static walkthrough. During my experiences the talent was wonderful and really sold the old western setting that fits ever-so-naturally in Ghost Town at Knott’s Scary Farm. Last year Dominion of the Dead was brought back to Haunt in a big way. For those who are unfamiliar with Dominion, it was a highly popular maze that ran from 1995-1999. It was then replaced later by Lair of the Vampire. Due to it’s popularity as well as Knott’s Scary Farm wanting to bring back one of its most popular mazes in honor of the 20th Anniversary, they returned Dominion. This year Dominion returns with a brand new twist. It now holds the theme of Dominion of the Damned and was completely redesigned from the ground up. The theme now surrounds the mystery of the King who sits mysteriously at the end of the maze as you wander the halls filled with blood-sucking vampires. Visually this maze takes a creative and aesthetic vision and brings it too life. Personally, I wasn’t a huge fan of Dominion in last year’s version, but the changes made to the haunt this year have completely won me over including a brand new foyer scene as well as the return of some iconic moments from last years event. While my biggest complaint from last year was that the rooms felt too 2d-ish, they’ve gone to amazing lengths to insure that was not the case this year. The changed alone warrant a return to the Dominion at your next haunt visit. Unfortunately by the time we got to Mirror Mirror my camera battery was long dead, but the maze concept is simple enough. Imagine a room full of infinity mirrors, now try to navigate through these hallways to find your way out. Unfortunately, while I love the experimental concept for Mirror-Mirror, it just doesn’t feel like it fits in a large theme park environment. The biggest weakness is capacity. About 15-20 people enter every 3-4 minutes meaning wait times can stretch up to 2.5 hours, something not usually common at haunt since Knott’s mazes aren’t known for pulsing guests into mazes except on ultra-busy nights traditionally (as it should be), a maze at haunt runs at high capacity meaning there is very little wait time. The theme is beautifully done on the interior in a steampunk fashion to fit into the Necropolis scare zone, and it does beautifully. If you can manage to hit up Mirror Mirror early on in the night, it’s definitely worth checking out, especially since no other large scale haunt is doing a mirror maze quite like this, otherwise you might be stuck in line for a large portion of the night. The Hanging returns this year for its annual pop-culture bash-fest! 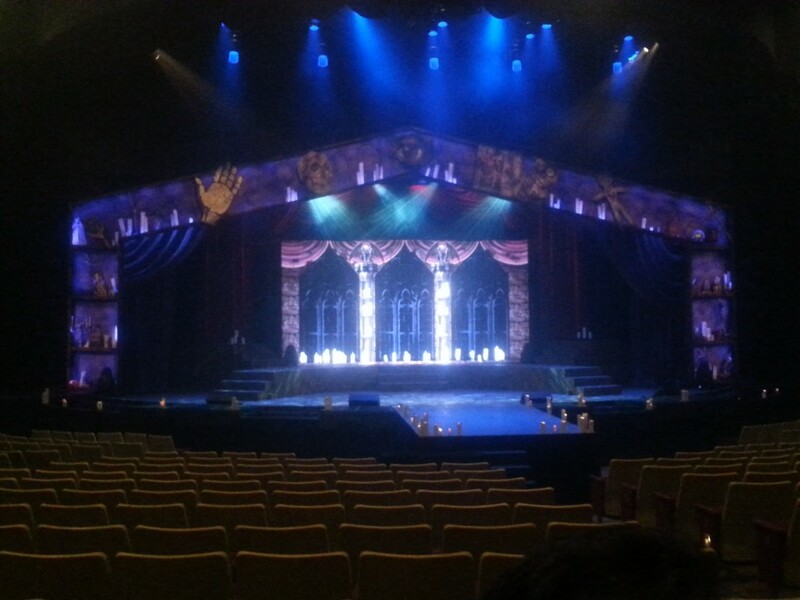 They went all out this year with a huge set and multiple hilarious musical numbers. It’s hard to describe the show without giving too much away, but it’s safe to say that this is one of the better hanging shows we’ve had in the past 5 years. A new addition to The Hanging is the inclusion of Scratch and Sniff cards, which feature 6 different smells that you can activate during the show when cued. These do not smell very good, and if you don’t have a problem with your hand smelling like a hobo’s private areas and vomit mixed with a mojito, you may want to pass on the scratch and sniff aspect, but it does add a new level of gross-ness to the show in a fun way. Special guests in this year’s show include Paula Deen, the cast of Star Wars, the Wicked Witch, and of coarse brainless movie executives. This years plot revolves around a group of movie studio executives who have run out of ideas as well as IP’s to remake and reboot, so they must dig a bit deeper unleashing a new evil. This evil includes but is not limited to The Walt Disney Company, where they performed a hilarious spoof on classic Disney Melodies from the 1990s. Every year they search for the worst offender of the prior year and the show ends with that certain celebrity or person who has heavily influenced the year being hanged. Won’t spoil too much about this year’s hanging victim but let’s just say she needs to keep her tongue in her mouth. This year marked the highly anticipated return of Elvira: The Mistress of the Dark in her new show “Elvira’s Sinema Séance”, the show picks up as if Elvira never left (or aged!). It is basic in it’s formula – Opening Dance Number, Elvira comes out and interacts/mocks audience members, then things go south as she is sucked into the world of horror movies. The second half of the show takes place entirely in video form as she wanders through various horror movies including The Blair Witch Project, Saw, Silence of the Lambs, and much more! One of the highlights of this years show are the background dancers, the famous dance crew from America’s Got Talent the Academy of Villains, these are not your normal theme park dancers. 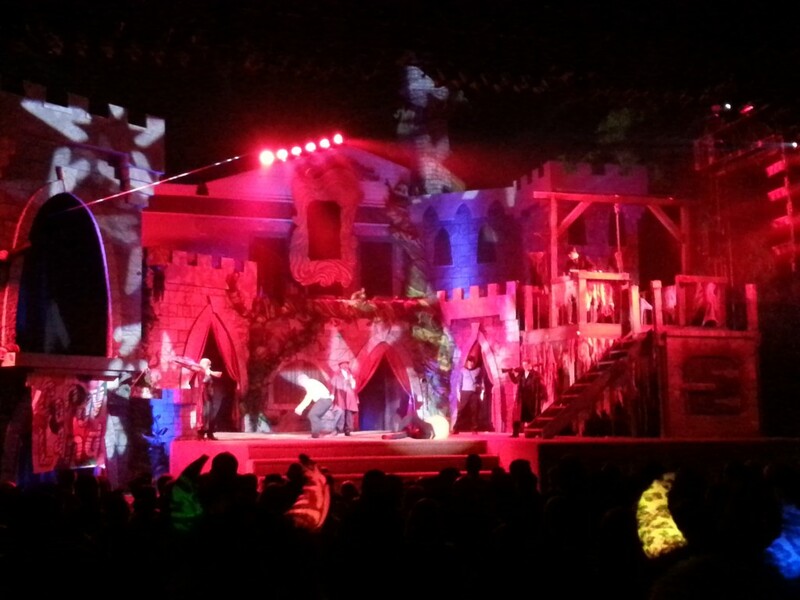 They’re doing flips, and handstands, the whole show is very glossy and fits the return of Elvira perfectly. Overall the show is one of the best Elvira shows that Knott’s has had, it’s definitely worth checking out during your stay at haunt. As mentioned in the first paragraph, we were not able to experience everything at Knott’s Scary Farm, including a few returning mazes, as well as a few of the smaller shows including Possessed (which is getting overwhelmingly positive reviews), Cursed, Blood Drums and Carny Trash and Trapped: The New Experiment. I hope to update this article as I come around to eventually visiting haunt again and finish the event to completion. It’s one of the largest Halloween events on the planet. You will not get everything in a single night. But the event is always changing, and updating so it’s very easy to come back and see new things that weren’t around on opening night. This year is one of Knott’s strongest years ever. Every new maze that was introduced all attempted to do something new, and unique. That is why Knott’s is considered one of the best by many publications around the world including ourselves. What people love about Haunt so much is that it doesn’t rely on movie properties to hold its event up. The creativity, the set décor, the scare zones, are things based out of the minds of some pretty sick and twisted designers, and we wouldn’t want it any other way. With the addition of Elvira, a solid Hanging Show, Possessed continually scaring people to tears (so we’ve heard), Entertainment at haunt is also top notch. Until next time… Thanks for checking out this quick review of Knott’s Scary Farm. Previous PostThe MUST SEE-Most Haunted Halloween attractions of 2013 Next PostUniversal pictures to release World of Warcraft movie in 2015-Could theme park attractions be far behind? Knott’s Scary Farm Returns! A Look at What’s New for 2016!